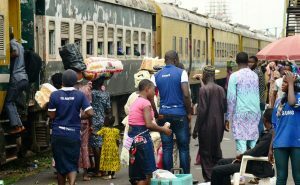 Eid-el-fitr: Osun offers free train service from Lagos – Royal Times of Nigeria. The free train service, which commenced in 2011 during festive periods, is aimed at facilitating a stress-free homecoming for the people during the festival. The Osun Government says it will provide free train ride for its indigenes from Lagos to Osogbo during the Eid-el-Fitr holiday. The Commissioner for Industries, Commerce, and Co-operatives, Mr. Ismaila Jaiyeoba-Alagbada, gave the information in a statement on Thursday in Osogbo. Jaiyeoba-Alagbada said the free train would leave Iddo terminus in Lagos to Osogbo on Saturday, June 24 by 10 am and return to Lagos on Tuesday, June 27 by 11 am. He said the train would also pick passengers along Ogun and Oyo corridor. Jaiyeoba-Alagbada said the service was in continuation of the commitment of Gov. Rauf Aregbesola’s administration to making life more meaningful for the people of the state. According to him, the free train service, which commenced in 2011 during festive periods, is also aimed at facilitating a stress-free homecoming for the people during the festival. The commissioner urged indigenes of the state who wish to come home to celebrate Eid-el-Fitr to make use of the opportunity of the free train service. “We encourage holidaymakers to use this opportunity to update themselves on the developments that are taking place in the state. “The Aregbesola administration, regardless of the negative hate campaigns of those that are threatened by its massive pro-people policies, has created an enduring legacy of service. “We have renewed our urban settlements to attract investors. These and much more would be the spectacles to behold when they visit Osun,” he said.